This Cape Cod renovated home has new appeal, especially its kitchen! 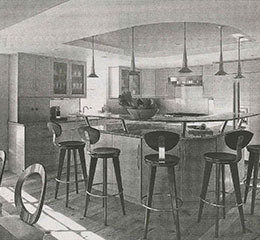 The kitchen features a granite island that is set at work height, with a contemporary raised glass top set at the height of the bar stools for dining. The curvature of the bar matches the curative of the ceiling, creating a refined look. This article, written by Laurie Higgins, appears in The Cape Codder, The Register, The Bulletin, The Bourne Courier, and The Sandwich Broadsider Supplement.